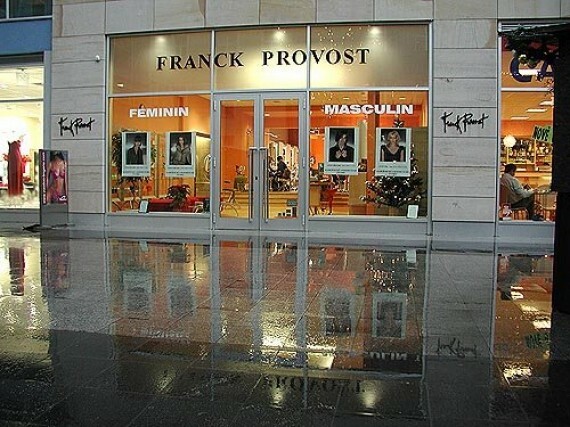 There are currently 3 Franck Provost unisex hair salons in Prague, the largest of which is located in the rear garden area of Slovansky Dum, Na Prikope. The Czech Republic is one of 22 countries around the world where this international chain currently does business. Open 7-days a week with a total of 23 workstations, it is usually easy to get an appointment pretty much straight away (except during the busy Christmas and New Year periods). The staff are well-trained, experienced, warm and friendly. This could possibly be due to the motivational seminars, trips and promotions that they are constantly offered by their employer. For instance, every 3 months, all stylists attend the Franck Provost academy in Paris to learn about new hair and colouring trends. I have been coming here for over 3 years now – mainly to have my hair dyed. When it comes to colouring my hair, I am quite fussy. My grey hair has gotten the better of me, and these days I need help from the bottle once every few months. My colour is dark brown but I prefer to have it light with blond streaks. For me the most important thing of all is that the final result looks as natural as possible. Fortunately (for me), at this salon they have always managed to get the colour right. During your first visit (for colouring) a colourist will show you a huge book full of samples and will offer his/her expert advice. A record of the dye combinations used on your hair will them be kept on the FP database for any future visits. One person will colour your hair but it will usually be cut, washed and blow dried by a different stylist. Each of these then issue their own separate bill, which is added up at the end of your visit. This emphasis on colouring is reflected somewhat in the extensive supply of hair dye tubes that line one of the walls. All of these are supplied by Franck Provost Paris. One can also purchase items from a large variety of L’OREAL & Franck Provost hair care products. Tea, coffee and juice are offered at the salon but are later added onto the final bill. The staff are predominantly Czech-speaking but all of them can communicate in basic English as well. In case of a linguistic ‘emergency’, a receptionist can be called to the rescue. During trading, there will always be an English, French or Russian speaker on duty. Japanese people can make appointments with Tomo – a native who colours and cuts both adults and children, and Macedonians can do the same with Igor! In addition to offering a full range of hair services, Franck Provost also does manicures and pedicures and employs 2 full-time make-up artists. These do anything from make-up application for the day or night-time as well as weddings and other celebrations or social events (this can be combined with hair styling as well). For an additional cost of 600 CZK (transportation fee) the make-up artists will also come and visit you at your chosen address anywhere within Prague. In the past, Franck Provost has held special ‘parent & child’ hair cutting promotions but essentially, the salon is mainly intended for adults. The only downside is that it is a bit on the expensive side. The final price depends on your hair and what you decide to have done. I would suggest asking for a general quote in advance. DIRECTIONS: By Metro (Yellow Line B – get off at Namesti Republiky and walk to Na Prikope street – 5 minutes) or by Metro (Green Line A – get off at Mustek and walk down Na Prikope street in the direction of the Powder Tower (Prasna Brana – 5 minutes). By Tram: 5, 8 or 14: get off at Namesti Republiky and walk to Na Prikope street. By Car: Paid underground parking is available at either Palladium Shopping Centre or Kotva Shopping Centre – Both on Revolucni Street.